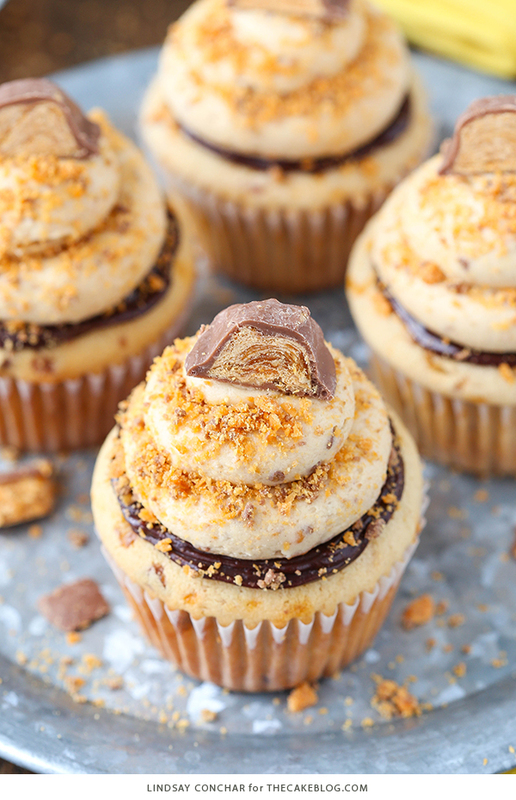 Butterfinger Cupcakes – the ultimate Butterfinger cupcake recipe! 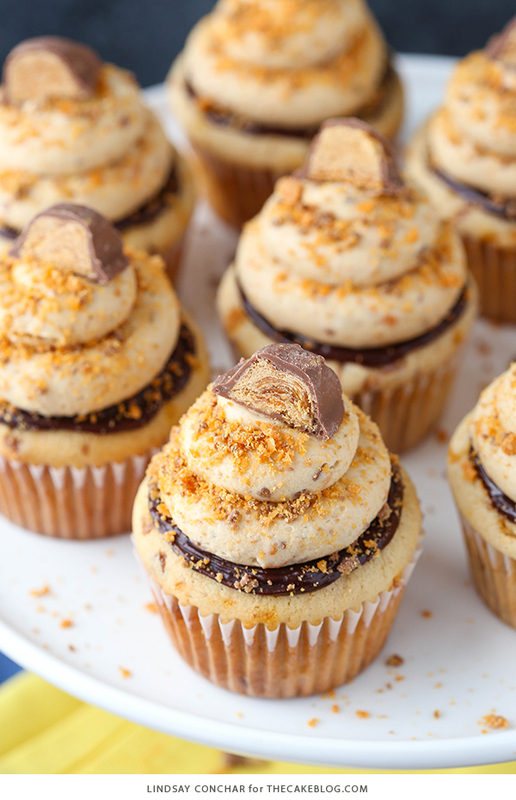 Peanut butter cupcakes, chocolate ganache and peanut butter frosting with crushed Butterfingers. Created by our contributor, Lindsay Conchar. I don’t know about you, but for me Halloween has always been all about the candy. The costume was simply necessary in order to get said candy. I’m pretty sure I was a witch for many years simply so that I’d have a costume and could go trick-or-treating. And when it came to candy – the more, the better. We’d go door to door for hours. Then when my brother and I were done trick-or-treating, we’d pour all our candy out onto the floor, sort it and then trade the candy we didn’t like for other candy. Of course Butterfingers have always been a big hit. Who can resist the crunch and the peanut butter?! 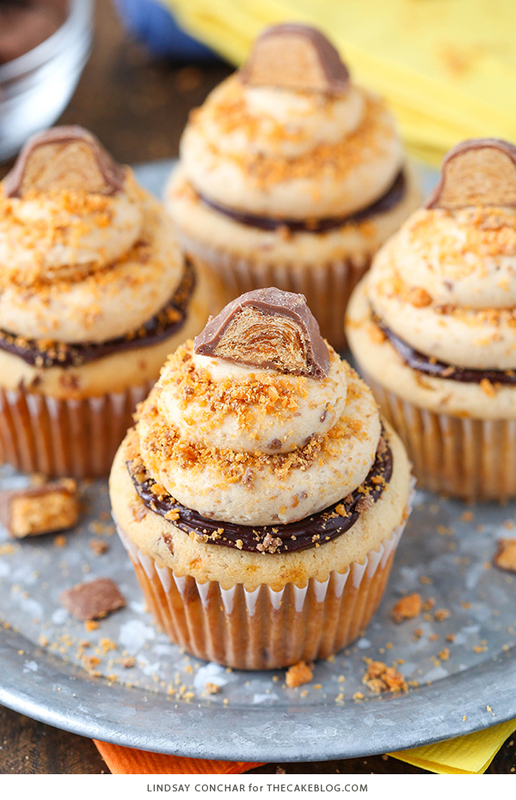 These cupcakes really are the most delicious way to eat a Butterfinger. The cupcake is light, fluffy and full of peanut butter. And to make sure it has that extra special Butterfinger flavor, it has bits of the candy that are crushed up and added right to the batter. Just a tip – if you have a food chopper, that was the easiest and quickest way to crush up the Butterfinger. Worked like a charm! Once the cupcakes are baked, they are topped with a little layer of chocolate ganache. I thought the chocolate would break up the peanut butter a bit, plus Butterfingers are covered in chocolate, so it’s totally necessary. ☺ You could even drizzle a little chocolate over the top, if you like. 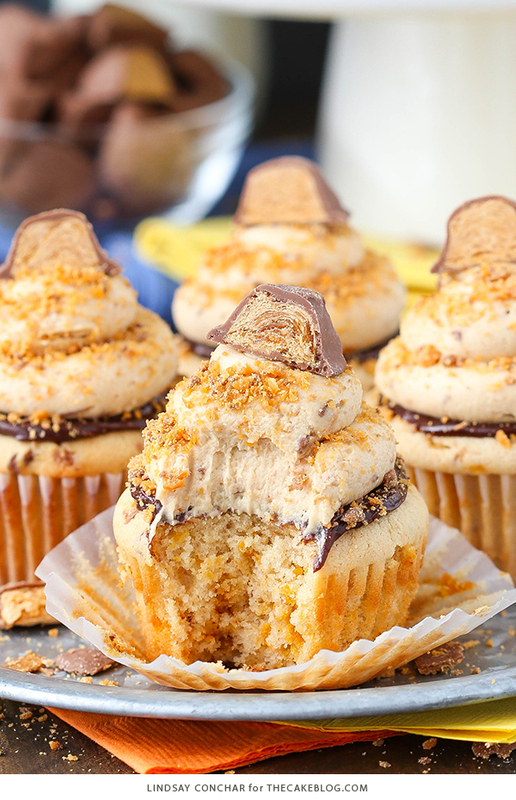 Sitting atop the cupcakes is a peanut butter frosting that is again filled with crushed Butterfingers. The combination of everything is perfectly peanut butter-y with the distinct flavor of Butterfinger. Perfection! I shared these with friends and they were a big hit! At first they claimed they were too pretty to eat, but they quickly got past that and devoured them all. I hope you enjoy them too! 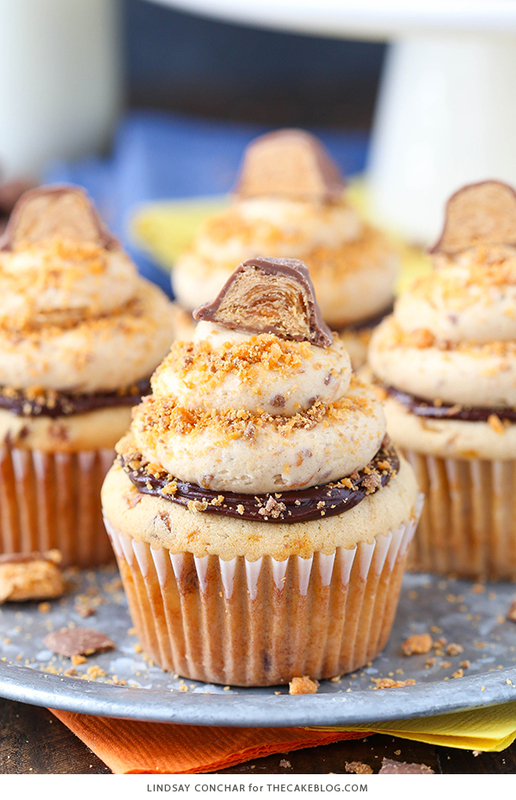 The ultimate Butterfinger cupcake recipe! 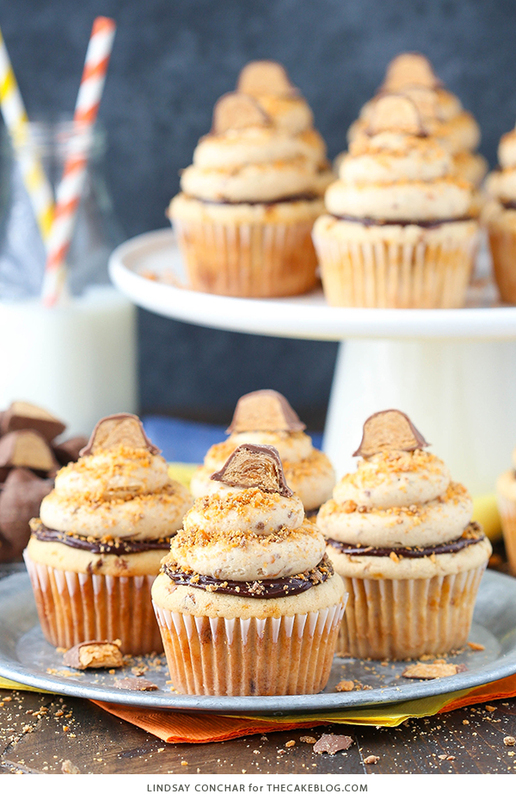 Peanut butter cupcakes, chocolate ganache and peanut butter frosting with crushed Butterfingers. In a large mixing bowl, combine sugar, brown sugar, butter and peanut butter. Using an electric mixer on medium, beat until light in color and fluffy, about 3-4 minutes. Do not skimp on the amount of mixing time. Add sour cream and vanilla extract and mix until well combined. In a separate bowl, whisk together the flour, baking powder and salt. In a separate small measuring cup, combine the milk and water. Stir in the crushed butterfingers. Fill the cupcake liners about halfway. Bake for 18-20 minutes, or until a toothpick inserted comes out with a few crumbs. Remove cupcakes from oven and allow to cool for 2-3 minutes, then remove to cooling rack to finish cooling. Add the chocolate chips to a medium sized bowl. Microwave the heavy whipping cream until it almost comes to a boil. Pour the cream over the chocolate chips, cover the bowl with clear wrap for 3-4 minutes, then whisk until smooth. Set aside to cool. While the chocolate ganache cools, make the frosting. Combine the butter, peanut butter and shortening with a mixer until smooth. Add about half of the powdered sugar and mix until smooth and well combined. Add 2-3 tablespoons of water or milk to the frosting and mix until well combined. Add additional water or milk, as needed, to get the right consistency, then stir in the crushed butterfinger. Set aside. Spread a layer of chocolate ganache onto the top of each cupcake. Pipe the frosting onto the top of each cupcake. I used a large round pastry tip. 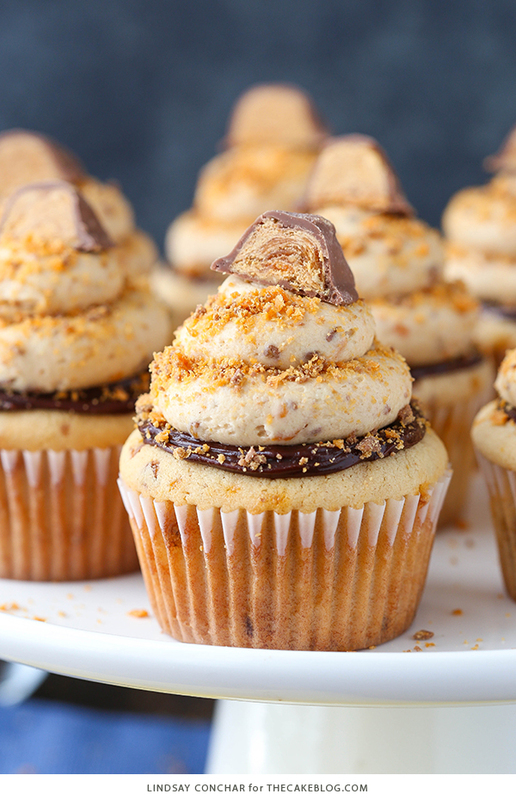 Top the cupcakes with additional crushed butterfinger and a piece of butterfinger, if desired. Can I double this recipe and make a cake? Also I can I substitute shortening with butter and if so do I use the same amount? And yes, you can substitute butter for the shortening, using the same amount. Lindsay uses a mixture of butter and shortening to help stabilize the frosting at room temperature. But all butter is delicious too! 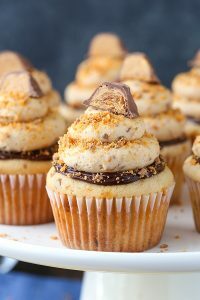 I love butterfingers and I am swooning over these cupcakes! Yum!! Hi, i don’t have access to butterfingers. Can you describe the flavour so that I can find a similar substitute here in Australia? Wow a yummy cake there. but no idea what butterfingers are. The recipe does *not* say to whip the egg whites. It says to add the egg whites in two installments, mixing each until well combined. But what seemed to be the problem? I baked these last night and followed the recipe exactly. Then came out sunken in I’m thinking to add more flour to it? I’m trying again today! Turned out amazing! Made them as mini cupcakes and halved the baking time. The only issue is with piping the butterfinger frosting, the butterfinger pieces can get stuck in the piping tips. Make sure you use a super large piping tip so they don’t get stuck. I like this recipe very much.but I want to know what crushed butterfingers is. Is it a kind of biscuit? Or chocolate? This recipe is good flavor wise but it’s terrible when baked! I’ve made this recipe 3 times.. each time 24 cupcakes and they don’t bake right. Something can’t be right in this recipe. My cupcakes sink in so bad and then harden like a cookie with the butterfinger in it. I made it without the butterfinger and it turned out okay. Still a dry cupcake even taking out early and moving to racks immediately. Will keep the frosting idea but not the cake part.